Throughout the year I am always on the outlook for small stocking stuffers that are useful. My top choice this year: the Resqme – an escape tool designed to be a window breaker and seat belt cutter in an emergency or vehicle entrapment. Although the chances of being in an accident are low (a driver can expect to be in one accident every 15-20 years, depending on the insurance company), most drivers can expect to be in 2-3 accidents over their lifetime which could involve water, fire, and entrapment – all the more reason to be prepared. The Resqme tool holds a sharp blade to cut a jammed seatbelt and a spring-loaded spike to shatter a car window, easing escape. The Resqme was originally designed for emergency personnel but is an ideal tool for any driver. Small (3 inches by 1.5 inches) and lightweight (less than an ounce), the Resqme can be used as a key chain because the protective slant of the concealed blade within the sides of the tool means you don’t have to worry about cutting yourself. 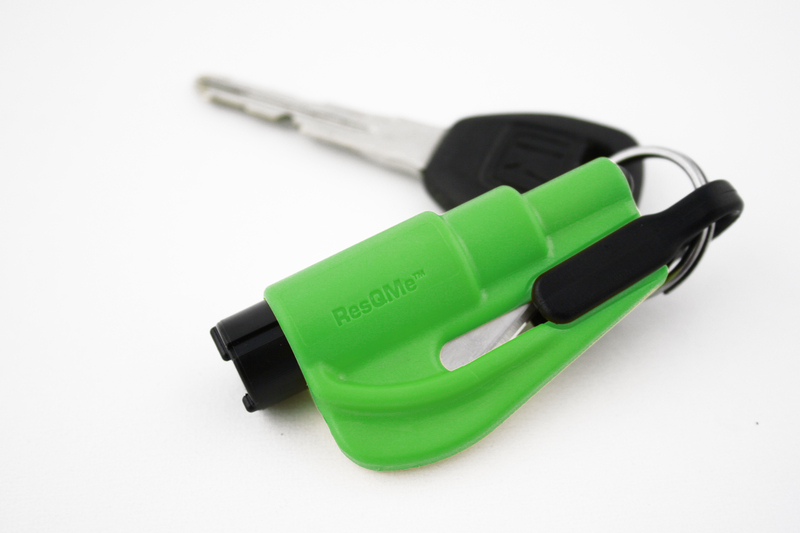 Carry it as a key chain so the Resqme is always within reach when seconds count. To use the Resqme, simply pull the clip away to reveal the blade within the side of the tool. Slide the blade along the seatbelt to cut. To shatter a window, push the black head against the window. It’s that simple. The Resqme is made in the United States (yea!) and comes in 8 fun colors: red, blue, orange, pink, yellow, fuchsia, green, and black. Available for about $10 on-line through most automotive stores, safety supply stores, and www.amazon.com. To read more about the Resqme or watch a short video that shows how the tool is used, go to the company website: www.resqme.com.